General Alexander Spiridovitch was the Chief of Secret Personal Police in charge of protecting Nicholas II and his immediate family at all times outside of the Imperial Palaces. He served from 1905 until the outbreak of the First World War in late 1914. His two volume work "Les Dernieres Annees de la Cour de Tzarskoe Selo", (Payot, Paris, 1929) is an invaluable day to day account of the Imperial Family, and important events around them during those years. Published originally only in Russian and French, it has been a neglected source until recently. The following account of the appearance and rise of Rasputin in St. Petersburg, in 1908 and 1909, is my own translation from the French undertaken in 2004. 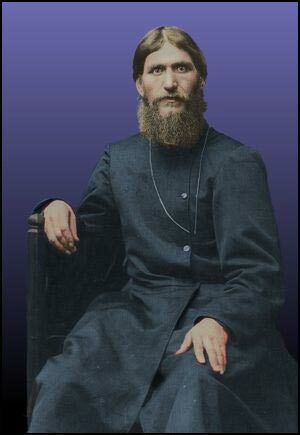 As we shall speak of later, Rasputin was introduced by Bishop Theophane into several salons of Petersburg society, where he gained, between 1905 and 1908, a large popularity in the capital. People were quite interested in him. During that time, it is true, it was most fashionable to be interested in faith and religion. He immediately had a suite of fanatical female admirers. They often spoke of a certain Mme. Lochtina, one his first admirers among the ladies of society, who under his influence, radically changed the way in which she lived. Rasputin had cured her of a serious illness which they doctors had fought against in vain. Under the influence of the "staryets", this woman, who loved life, left society and devoted herself entirely to religion and finally enrolled in the Verkhouturye convent. Mme. Lochtina was the first lady in Petersburg who made the pilgrimage to Pokrovskoie to see Rasputin. They peasants in Pokrovskoie were totally astonished to see one day that a pretty young woman had come expressly to their village to display her admiration for Grigori Yefimovitch Rasputin. Arriving in Petersburg, Rasputin, after having stayed for some time in the hostel of Athon, moved into the Lochtine home, at Peski. At that time, people believed strongly in the extraordinary strength of Rasputin's prayers, such that Stolypin himself, after the explosion of August 12, 1907, invited him to come to pray for his sick daughter. The salons competed for Rasputin. The unbalanced ladies of Petersburger society spoke of nothing but him, thought of nothing but him. They taught him to dress properly, comb his hair, wash, and many other things then as well. Already by then, a certain number of people had thought to make use of Rasputin for the success of their intrigues. His extraordinary gift to forsee events and the suggestive force which he exercised gave birth in the hearts of many to the idea to use him to attract the attention and kindness of Their Majesties to themselves, to see if they could create the possibility of influencing the Empress and Emperor. Rasputin himself was not yet shed of his simplicity. Those men without ceremony were not shy to offer him a three ruble note which he accepted with recognition. However, already, one could notice certain changes in him. This under the influence of his conversations with highly placed people or with those representatives more or less seen in the worldly society of Petersburg, or under the influence of the prediction he made about the former Blessed Macarius of Verkhoturye concerning the extraordinary role he was destined to fulfill, always it was Rasputin who they saw to be more and more convinced of himself as someone who was destined to do something great and good for the Tsar and Russia. He already had said to some of his loyal followers that the Tsar was surrounded by lies and injustice, and that the nobility who approached the Tsar were deceitful. Only a sincerely devoted man, disinterested and simple could ultimately serve the Tsar and the people. This conviction became stronger in Rasputin; more and more, and in all sincerity, it seemed to him, he believed in his mission, encouraged by those who, for their own ends, wanted him to create a solid position in the Court, and pretended that he himself spoke out of his own mouth for the entire Russian people. In 1908, Rasputin's position underwent a brusque change. A.A. Vyroubova entered among his admirers and lost no time in occupying the premier place. She knew him, as we have already said, for less than a year. "A month before my marriage, the Empress asked Grand Duchess Militza Nicholaiovna to have me make the acquaintance of Rasputin. The Grand Duchess received me in her Palace on the English Quay, and seemed most kind to me and spoke with me for two hours about religious matters. I recall to have been very emotional when Rasputin was announced. 'Do not be astonished' she said to me,'we are always given a kiss at Easter.' I saw Grigori Yefimovitch enter, thin, emaciated, his face pale, dressed in a black robe; his eyes, with an extraordinary penetration, struck me immediately and I recalled John of Cronstadt. A month later, Rasputin predicted an unhappy marriage for her, and that prediction came true. And, now, after her divorce, becoming free and independent, A.A. Vyroubova was heard to speak of the marvellous results of Rasputin's extraordianry prayers, and openly became his fanatical admirer, the driving force of his cult, and was at the head of his loyalists. Religious to the point of extreme, already knowing about Rasputin's profound clairvoyance from her personal experience, his extraordinary faculty of seeing what will come, she fell blindly under his influence. With the death of Father John of Kronstadt, "Father" Grigori became, in her eyes, the only mediator with God, the only man with effective prayers. He was called to replace Father John. Did he not have the same eyes as he did? He is a simple man, good and who wants nothing. That winter, after returning from the fjords, Rasputin began to frequent the home of A.A. Vyroubova at Tsarskoie Selo where he had already been admitted into the circle of her relations: Officer Loman and Officer S. from one of the regiments garrisoned at Tsarskoie Selo. It is thus gropingly that the "staryets" paved his way, while strange rumors circulated around the little house in which A.A. Vyroubova lived. Her maid, a quick witted girl with a turned up nose, who had disturbed the calm of more than one robust sailor on the yacht, and who had boyfriends everywhere, thanks to her playful nature, would tell the story, with brilliant laughter, to her friends that her mistress adored a "muzhik", prayed with him, and even had herself photographed with him. She would even show them the photos to some people. At the time of which we are speaking, A. A. Vyroubova was no longer the young naïve person, ignorant about life, which she had been some years earlier. This was a woman, and a woman who had gone through the experience of an unhappy marriage, having learned much since she lived at Court, and was initiated into the intrigues of Petersburg society. As well, her father was a man of excessive intelligence, the most cunning and prudent of all the men at Court, who himself became a supporter of Rasputin. Rasputin was introduced into the Taniyev house, was received there in a most friendly way and who was shown all of their favor. Taniyev himself had long conversations with him. This intimacy between Mme. Vyroubova and Rasputin and the fact that he was being received in the home of a man as serious as Secretary of State Taniyev, again raised Rasputin in the regard of Petersburg society. Everyone knew full well about the intimate friendship which Their Majesties displayed for A.A. Vyroubova, and everyone knew the power and influence of Taniyev. Equally important was the fact that Vyroubova and her father had put him under their protection, which alone was enough to make him a man who has desired, sought after, and fashionable. Little by little, Rasputin was monopolized by the small circle of women around A.A. Vyroubova. He became their apostle. In that circle wee many lady friends of Mme. Vyroubova, her sister, married to the officer Pistolkors, son of the morganatic wife of Grand Duke Paul Alexandrovitch, who was at that time yet Countess of Hohenfelsen, the sister of Countess Mme. Golovina and her daughter and, later, Countess Witte and her husband. This group served as the intermediary between all of Rasputin's other female admirers and Mme. Vyroubova. As she was very much occupied at Tsarskoie Selo, it was this group which, so to speak, protected Rasputin in Petersburg in her absence and preserved all other fashionable influences. Rasputin, the religious man, was totally monopolized only by Mme. Vyroubova's circle. Little by little, he dropped his first lady admirers, of more humble position. They had already lost their charms in his eyes. He only maintained relations with one or two of them. He would no longer entertain except with very great ladies. Rasputin prayed with his lady admirers, went to churches with them, preached and instructed them on holy life. He took his role more and more seriously and his lady admirers became a true cult. Many of them were a mixture of bigotry and buffoonery. It was truly a religious circle around Rasputin and Mme. Vyroubova. Those who took part in it believed they had nothing to be reproached about and displayed so openly, going even so far as to be photographed as a group with their master. They did not fear publicity and so those photographs were passed from hand to hand. Mme. Vyroubova herself fell more and more under Rasputin's influence and lost no time in becoming his spiritual slave. However, at the same time she was the intimate friend of Empress Alexandra Feodrovna. She saw her every day, morning, afternoon and evening. The two friends spent many hours in intimate discussions primarily about matters of faith and spirit. These discussions, that closeness greatly intrigued the household and those members of the suite who were closest; jealousy and human corruption took to looking in them to find something extraordinary, something evil. Rumors were spread which quickly were repeated in the capital. They circulated a fable of the most absurd kind about the relationship which existed between the two friends. They still ignored the accounts about the "staryets", his prayers, and that the discussion of his teachings formed the principal subject matter of these endless discussions, mysterious to those persons not yet initiated, which took place between the Empress and her close friend. "The Tsarina has become a most devoted woman" the servants said who, having noticed the state of religious exaltation in which they often found the Empress, but could not really find how to explain it. Thus, by the intermediary of Mme. Vyroubova, a religious bond was formed between Rasputin and the Palace. Rasputin's friends in Petersburg: Witte, Taniyev, Prince Mestcherski, the Golovines, and others, knew to what extent that bond was necessary, not only from a religious standpoint, but also from that of political intrigues, and so they began to influence Mme. Vyroubova, to encourage her in all their ways. However, at that time, Rasputin had with Their Majesties a defender who was much more powerful, more influential and with more access than all others: Bishop Theophane, who, in 1908, had become Confessor to Their Majesties. Could they not trust their spiritual guide, could they not have faith in the words of a man of such solid religious convictions, of such vast theological knowledge and whose unshakeable devotion to true Orthodoxy was universally known, in the clergy no less? At that time, Bishop Theophane was already very much in favor with Their Majesties, and it was thanks to their intervention that he had been named rector of the Theological Academy of Petersburg, replacing Bishop Sergius who had been named Bishop of Finland. Bishop Theophane was also sent, at the Empress's wish, to Rasputin's native village in order to gather information about him there. The Bishop spent some time in Rasputin's home in Pokrovskoie, and discussed the subject of him with the Blessed Macarius, of Verkotouie and reported the most favorable information back to Their Majesties. The Empress displayed greater and greater respect for the "staryets" and believed more and more in the effectiveness of his prayers. The Empress's veneration became known to the circle of Rasputin's zealots in Petersburg and again raised even their esteem even higher for this new preacher to his advantage. Rasputin came to Tsarskoie Selo from time to time, to Vyroubova's house; he sometimes encountered Their Majesties there and talked with Them. His accounts, without any tricks, about peasants, the life of common people, his extraordinary simplicity, and his apparent naivete greatly pleased them, even more than his religious piety. He was invited on two or three times to the Palace. Meanwhile, Their Majesties wanted, according to the Emperor's will, to verify their impression of him, and so they asked many persons in the suite, including Dyedyuline, to make Rasputin's acquaintance. The meeting, which took place in Mme. Vyroubova's home, was far from being favorable for Rasputin. When the Tsar asked him what impression he had formed of Rasputin, Dyedyuline responded: "He is a cunning muzhik, false, intelligent, possessing a certain suggestive power which he well knows how to use." In Dyeduline's family, they could hardly be kind to Rasputin. Although some people pretended that, notwithstanding that, my boss often received the "staryets" in secret. I do not believe that whatsoever, that is a pure lie. And I saw proof of this in the following fact. Several years later, once Rasputin's influence had already become very large, Gen. Dyedyuline refused to give Rasputin an entry pass for the consecration of Cathedral of the Feodorovski Virgin. It was only a few minutes before the commencement of the ceremony that, under Her Majesty's personal order, Dyedyline would permit Rasputin a pass to enter the area reserved for the general public. Rasputin had no better chance with Col. Drenteln who quite frankly despised him. Prince Orlov who, at that time, yet held a very important position, could not refrain from attacking him every single time he had the opportunity. Admiral Nilov could not stand him at all. As for those who lived a little more to one side, like Freedericks, Benkendorff, Grunwald and others, they simply shrugged their shoulders. This hostile attitude among the members of the suite lasted until the very end. Aide de camp Sabline was the only one to have any relations with Rasputin at all, and that was only for him because he felt a moral obligation to do so, because of the close friendship which he enjoyed with the Imperial Family. Even still, he was far from being a supporter of Rasputin. The ladies and maidens of honor to the Empress could not hide their hostility towards Rasputin at all. It was thus for example that Mme. Narychkina who, after having filled the duties of assistant to the Mistress of the Court, Princess Galitzine, and having fully replaced her, had tactfully declined the Empress's proposal that she make Rasputin's acquaintance. Among those persons who, without being a part of the suite, came near to Their Majesties, Loman, an officer in His Majesty's personal regiment, and a great admirer of Father John of Cronstadt, was the only one at all to have friendly relations with the "staryets". This hostile attitude towards Rasputin by those persons in the entourage who were closest to Their Majesties ended up having an effect on some of them, like a slingshot, being incompatibly opposed to the duty which they had to their Sovereigns. It was infinitely more prejudicial to the Imperial Family than any revolutionary agitation, an effect which most of the people crossing over to the opposition certainly did not wish, even less than in the era in which we now live. It was thus equally that it became the order of the day that we had to know what sort of attitude we, in the security service had to adopt with respect to Rasputin. We arrived at the conclusion that we had did not have to guard him nor put him under surveillance; unless that should become necessary, it was left to the Minister of the Interior, with his Section of the Okhrana, to worry about his guard, his surveillance, and that we had nothing to do ourselves in this regard. After the information had been gathered, it did not lend itself, from a political point of view, to any suspicions; and should it have done so, it still would not have been of any interest to us. We therefore had no real reason to see in the question of Rasputin a question of the State. The enthusiasm of which he was the object did not seem to be at all dangerous to us. The order was thus given to view the Rasputin affair as a private matter, uniquely of interest to Their Majesties and to those whom we did not have the right to touch. In order to keep all of my freedom, I decided not to make the acquaintance of Rasputin. My detachment received the order not to be interested in him, not to pay any attention to him, and not to make any reports about him, so long as the question of the Emperor's saftey was not an issue. We had wanted however, to rid ourselves of the suspect "staryets". So my boss, Gen. Dyedyuline, personally asked Guerassimov to have Rasutin under surveillance and to confirm the bizarre rumors which were being spread about him. Stolypin, on his part, ordered that information about him be gathered in the Tobolsk region. As well as the information furnished by outside surveillance, the information gathered in Tobolsk was quite unfavorable to Rasputin. The man was truly of a deplorable morality. Guerassimov told Stolypin about the information he received. Stolypin recommended that he say nothing to anyone, but to write up a summary of it all so that he, Stolypin, could use it to make a report to the Emperor. In listening to the Minister's warnings, the Emperor joked and promised never to see Rasputin again. Guerassimov then went often to see my boss, who told him: "Then chase down that scoundrel! What has he come here to do?" He responded to him that it was up to the Minister to chase the soundrel. Why not have the "staryets" expelled if he believes he has serious reason to? Dyedyuline again spoke of the matter with Stolypin who asked Guerassimov to draft, without a word to anyone, a decree ordering Rasputin's deportation, by administrative means, back to his village, with the prohibition that he may not return to the capital for at least five years. Stolypin signed the decree and ordered Guerassimov to execute it. One day when the "staryets" had gone to Tsarskoie Selo, the Okhrana Section, which had him under surveillance for some time, had taken measures to arrest him on his return to Petersburg, on the route from the station to his residence. But then something bizarre happened. Had Rasputin been warned in advance by someone that danger awaited him? I do not know; but all of a sudden just as he arrived in Petersburg, he crossed the station running, jumped into a carriage which was waiting there and went to the palace where Grand Duke Peter Nicholaiovitch and his wife Militza Nicholaiovna lived. Despite day and night surveillance, the security agents never once saw him leave the palace for three entire weeks. And, then after three weeks a telegram arrived from the Governor of Tobolsk announcing Rasputin's return to his village of Pokrovskoie. Gen. Guerassimov asked Stolypin what he had to do so that he could maintain the prohibition on Rasputin returning to Petersburg for five years. The Minister made a gesture that meant "let it be" and ordered the decree to be destroyed. This all happened in the last days of 1908 and into the first days of 1909. 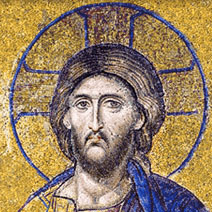 This is the front page of my Hagia Sophia mosaics website with links to all the pages and icons. Timothy Corrigan, a Pallasart client, is one of the most celebrated interior designers in the world. He has offices in Beverly Hills and Paris.